Sometimes buying Christmas gifts is fun. Sometimes it’s hard. If you’re like me, you’re always on the watch for that perfect unique gift for all your favorite people on your list. In this year’s installment of our annual Christmas Gifts for Writers post, see if you can find just the right gift for the writers on your list–or for yourself. Never too late to get that letter off to the North Pole, right? Every writer needs a mascot! Why not let your mascot be your muse too? Set action-figure Jane up on your desk for some everyday inspiration (or maybe just playtime). You can complete the set with Shakespeare, Dickens, and Poe. Save all your important writing and show off your proud inner nerd with this set of four 8GB flash drives, featuring our favorite Marvel Avengers. Jazz up your writing sessions with a visual symphony to accompany your writing music. It’s like the fireworks in your brain right before your eyes! Make sure you’re getting all your facts right in your latest story by double-checking commonly made errors in these handy reference guides. Life at a desk can cause major health problems, both to our backs, necks and wrists, and also to compressed internal organs. One smart solution is a balance-ball chair that encourages good posture, as well as circulation. That it strengthens your abs and other core muscles is just a bonus! Ergonomic mouses (mice?) have been attempting to address the problem of wrist strain and repetitive injury for a long time. This revolutionary new design seeks to mimic the more natural movements of our hands when writing, allowing for less repetitive movement. This model is designed for mobile tablets; they also offer a laptop model. Standing desks can be a great alternative to sitting all day at your computer. This model sits atop your desk and adjusts up and down, so you can choose when to sit and when to stand to best alleviate the pressure on your back. Zip up your place in your favorite book with this clever little bookmark. No more getting a crick in your neck while reading in bed. Lie flat and see your book’s pages without straining your eyes or contorting your position. Organize your latest batch of books and show off your punctuating style with these beautiful bookends. This gorgeous little number does triple duty as a fashion statement, a timepiece, and a reminder of this universal truism among readers and writers. Get your toes warm on Christmas morning with these funky odes to the retro library card. Perfect for Wordplayers who follow my daily #YouKnowYouAreAWriterWhen tag on Twitter and Facebook! Let the world know what it’s really like to be a writer. Get it? It’s a visual pun! I’m not generally much of one for writing exercises, but nearly every card in this deck offers some kind of insightful and cliche-bursting suggestion. Never waste time typing up research notes and the like again. Instantly, scan and digitize your entire library. Never confuse your charger with someone else’s. Stamp it with your personal style, for pleasure as well as purpose. This “Heroes” set is my favorite (naturally). Who says we can’t be tech-cool and old-school? Go back to your pencil-writing roots with this premium walnut digital stylus for your phone and tablet. Sometimes a change of scenery can do wonders for stuck creativity. Take your desk on the move with this stylish, space-conserving laptop desk. Hide your ugly old tissue box with behind this lovely handcrafted ode to old books. Keep your papers (and keys) off your desk and neatly sorted in this beautiful antique-replica organizer. What writer can’t always use another bookshelf? Take advantage of that empty corner space in your office to display even more of your favorite books. Finally, don’t forget that writing how-to books are always at the top of any writer’s list. You can check out my full list of Recommended Reading for Writers and my own series of writing books below. Merry Christmas, everyone! Wordplayers, tell me your opinion! 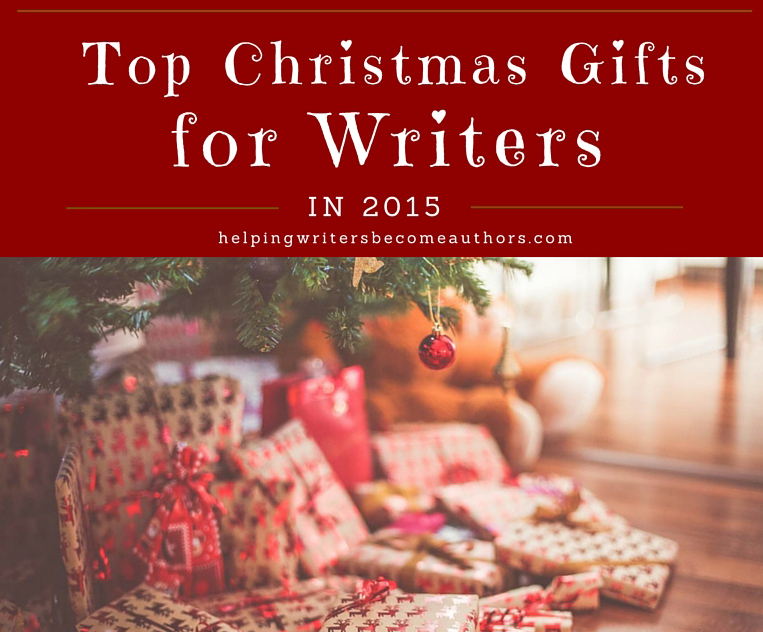 What are your top Christmas gifts for writers this year? Tell me in the comments! That t-shirt is perfect, so perfect. I love it! I always think of the Cameron Diaz’s “voiceover” in The Holiday. That’s pretty much how I go through my day! Another idea is the gift of time and solitude through a hotel gift card and the promise of a free weekend. I don’t think any writer would turn that down. Excellent post as always. Thanks, KM! These are great! I like the Jane Austen doll. I got myself Structure Your Novel and the workbook for my Christmas present. Ah, so that’s why Santa keeps calling me. 😉 Thanks, Eileen! I hope you find them useful in all your writing endeavors in 2016! Thanks for the suggestion! I’m always interested in books like that–as you can tell! I love Jane Austen. It’s hilarious that there’s an action figure. I also love the tissue box! I’m reclaiming the living room from “land of children’s toys” to “adult room that is actually decorated the way I like” since the kids are finally old enough to keep all their crap, I mean treasures, in their own room. The tissue box with the weird purple watercolored cardboard box that travels around the room is one of the last holdouts in getting the room organized. So clearly I need the antique book tissue box. And the other thing a writer would love for Christmas? Hours of quiet time to write! The standbys still work well–gift cards to a favorite book store, Barnes and Noble or Amazon. You can click through in their links above. The best writing-related gift I got was last Christmas when my god-mother got me a NaNoWriMo shirt. Until that point, my writing was a secret to the rest of the family (I talked to her about my writing since she’s a published poet). While it was a physical gift, she gave me the gift to finally express myself with my family. That’s great! I love how it was a gift with meaning beyond the item itself.